With expectations as high as ever in the nation's capital, the Nationals were plagued by injuries and inconsistent performances this season as they finished with 82 wins -- eight games behind the young and resurgent Braves. However, despite what might have been a down year in what's been a strong decade for Washington, there were bright spots, chiefly in prospect-turned-superstar Juan Soto. And with the likes of No. 4 overall prospect Victor Robles likely joining him in the Opening Day outfield, the Nationals have a lot to like about their 2019 chances. Essentially a few pieces away from becoming the National League East favorites again, the Nats not only have a positive outlook going into next season, but their farm system could possess some of the pieces to complete that puzzle and get them over the hump. Although their .483 organizational winning percentage might not stand out, they had plenty of positive developments from prospects that should bode well for the next few seasons. Catcher -- Tres Barrera, Potomac (68 games): A 2016 sixth-round pick out of the University of Texas, Barrera has adjusted well to life as a backstop in pro ball and was a solid asset for the P-Nats on both sides of the ball. From an offensive standpoint, the 24-year-old put up a .263/.334/.386 slash line against the Carolina League in his first crack at Class A Advanced pitching, helping him earn a midseason All-Star spot. There might be some concerns with his bat against better pitching staffs, but Barrera will get few -- if any -- knocks for his stalwart defensive play. He threw out 49 percent of would-be basestealers, a 19 percent improvement from 2017. That, along with his .991 fielding percentage, made him a plus defender. Nationals director of player development Mark Scialabba noted Barrera's innate ability to connect with the pitching staff and handle his own responsibilities behind the dish. Barrera also has the added bonus of being bilingual, helping him better communicate with whatever staff he's working with. "He can impact the game with his receiving and calling the game," Scialabba said. "He's got an above-average arm and a quick, athletic body that can repeat his throw to second base. He's a cerebral catcher. ... He has the intangibles you want in a catcher: he's a leader and a tough kid. He has the makings of someone who's going to catch for a long time." First baseman -- Aldrem Corredor, Potomac (59 games), Hagerstown (56 games): Spitting time between the Suns and P-Nats seemed to make little difference for Corredor, who hit well at both levels in 2018. He set stateside career highs with nine homers, 67 RBIs and a .300/.356/.436 line in 115 games. The Venezuela native didn't let his .217 average in April affect the rest of his campaign, hitting .311 in the second half after getting elevated to the Carolina League on June 21. Even with the jump in power, Corredor cut down on his strikeouts (109 in 2017, 79 in 2018), which Scialabba credits to the 23-year-old's compact swing. "He's got very good barrel awareness and bat-to-ball skills," Scialabba said. "He's someone who can hit the ball to all fields. Early on, he was a little bit behind physically due to the rigors of the offseason in his home country and he came in and took some time to get going, especially with the cold weather as well. But once he started feeling more comfortable and started getting his body to a better place, he really started to become a physical hitter looking to drive the baseball." Second baseman -- Cole Freeman, Hagerstown (122 games): Taken in the fourth round of the 2017 Draft, Freeman didn't make his professional debut until April but made it worth the wait. Thrown right into full-season play in the Sally League, he didn't skip a beat with the bat. The LSU product hit .266 with a .354 on-base percentage (walking 47 times) that was good for seventh in the league and tops on the club among those who played at least 50 games. A true top-of-the-order threat with plenty of speed to burn, Freeman also stole an organization-best 26 bases. "He's a baseball rat, high baseball IQ, loves the game and plays the game hard," Scialabba said. "He does everything on the field to the best of his ability and helps the team in a number of ways. ... He's a grinder. He's what our managers and coaches love to see on the field." Third baseman -- Jake Noll, Potomac (66 games), Harrisburg (66 games): Starting the year back in Potomac after a 17-game stint last year, Noll hit with plenty of authority. In his first 66 contests, the 24-year-old Floridian notched a .302 average with an .813 OPS to earn Carolina League midseason All-Star honors. The next 66 games in the Eastern League were not much different, with Noll batting .278 with 12 extra-base hits as he made the jump to Harrisburg. Supplementing his on-field accomplishments, he was given the Bob Boone Award, which goes to the Minor Leaguer "who best demonstrates the professionalism, leadership, loyalty, passion, selflessness, durability, determination and work ethic required to play the game the 'Washington Nationals Way.'" 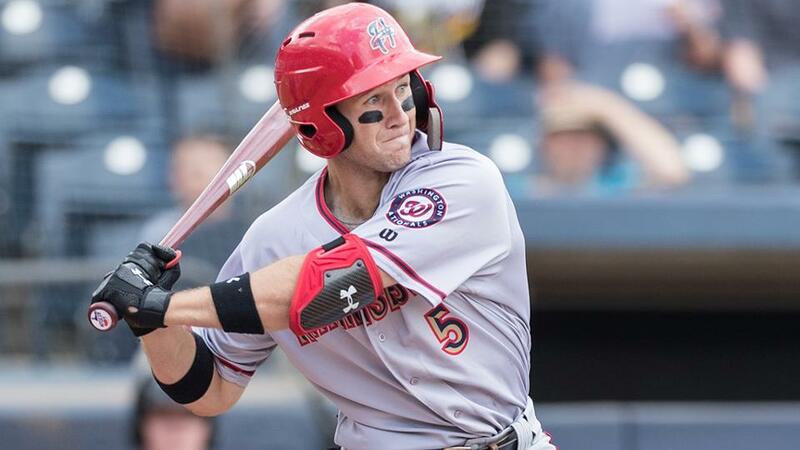 Shortstop -- Carter Kieboom, Harrisburg (62 games), Potomac (61 games): Back healthy after dealing with a hamstring injury last year, Kieboom proved to be one of the jewels in the system, taking home the Nationals Minor League Player of the Year award. Named a Futures Game selection and Carolina League midseason All-Star, the club's second-ranked prospect broke through in a big way with the bat. Between the two levels, he mashed 16 homers and compiled an .801 OPS in 123 games. A midseason promotion to Double-A did little to slow him down as he hit five long balls and posted a .721 OPS against better competition. He also belted three grand slams over the first two months of the season, all against Salem. With Kieboom putting up a .950 fielding percentage and participating in 57 double plays in 118 games at shortstop, the club feels he has the athleticism to stick at the demanding position. "It's exciting to see someone who can impact the game in all phases," Scialabba said. "Carter continues to show his abilities on both sides. Offensively, he doesn't try to do too much, but that game power is starting to play a little bit more now. You can see him drive the ball to right-center and he's not afraid to use the whole field." Honorable mention -- Luis Garcia, Hagerstown (78 games), Potomac (49 games): On most other clubs, Garcia easily would have nabbed the shortstop honor, but he had plenty of competition in Kieboom. As an 18-year-old, Garcia posted an impressive .298/.336/.406 line with 34 extra-base hits, including seven homers, in his first full season while earning a spot in the Futures Game. Alec Keller, Harrisburg (61 games), Potomac (29): The 26-year-old out of Princeton might not be a power threat, but he remained an on-base machine from start to finish in 2018. Keller raked with an impressive .337 average and .393 OBP (the best mark among stateside Nationals with at least 50 games) between the two levels. He kept his strikeouts to a minimum with 42 while sprinkling in 31 multi-hit games. Rhett Wiseman, Potomac (116 games): Repeating Class A Advanced level in 2018, Wiseman made major improvements to his offensive game, most notably in the power department. Along with a .484 slugging percentage, his 21 roundtrippers not only led the organization, they were good for the third-best mark in the Carolina League. He did have his fair share of strikeouts (122), but he drew enough walks (63) to produce a .361 OBP in 116 contests with the P-Nats. "He's a strong, athletic young man who was a three-sport athlete in his high school years, so we knew he had the athleticism and tools and he had a great career at Vanderbilt," Scialabba said. "He's a max effort guy and I think this year he really took to controlling the strike zone more. ... He started to show that power in the games, he has had that strength and ability to hit the ball over the fence. With a better approach this year, he was able to repeat that more." Yadiel Hernandez, Syracuse (95 games), Harrisburg (29 games): At 5-foot-9 and 185 pounds, Hernandez is not big, but he gets the most out of his frame. In his second season since leaving Cuba, the 31-year-old put up strong numbers. Between Double-A and Triple-A, he crushed 18 dingers and drove in 68 runs while batting .286/.369/.457 in 124 games. "He's got pop in that little bat and body of his," Scialabba said with a laugh. "He's a strong man and he's becoming more comfortable coming from Cuba and playing in the United States. It took some time to get used to, but I think this year he figured out who he was as a hitter." Honorable mention -- Juan Soto, Washington (116 games), Harrisburg (eight games), Potomac (15 games), Hagerstown (16 games): Yes, he spent the bulk of the year in D.C. (and nearly won NL Rookie of the Year honors), but it's hard to understate what Soto did in 39 Minor League games. In that small sample size, he still crushed 14 homers, drove in 52 runs and amassed a gaudy .362/.462/.757 slash line across three levels. Enough said. Utility -- Ian Sagdal, Potomac (101 games): Sagdal gave the Nationals plenty of versatility defensively by playing both corner infield positions and the outfield, but he also provided a stable bat that made him a strong breakout player within the system. The Washington State product made a return trip to the Carolina League and mashed with a league-best .318 average, 37 extra-base hits and an .824 OPS. A postseason All-Star, Sagdal hit over .300 in every month after April, including a season-best .346 mark in July. Right-handed starter -- Kyle McGowin, Washington (five games, one start), Syracuse (eight starts), Harrisburg (13 starts), Potomac (two starts): It might have taken two organizations and some better fortunes, but McGowin not only pulled through with his best professional season, he also made his Major League debut. Healthier than he had been in previous seasons, the 27-year-old flourished at all levels of the Minors in 2018 with a 2.80 ERA and 0.90 WHIP in 23 starts. Keeping contact to a minimum, McGowin fanned 152 over 141 2/3 innings while holding opponents to a .188 average. Despite his age, the Nationals are happy that he can be another arm they can call upon. "I think this year he commanded the fastball better in the beginning," Scialabba said. "Mentally, he was attacking hitters more aggressively. But I do think his breaking ball improved: the sharpness of it, the action on it, and it really became a pitch he could throw in the strike zone for strikes. He was able to manipulate that breaking ball and the changeup, too, because his changeup has really good late action to it. ... He's going to be part of our depth because of all the improvements he made." Left-handed starter -- Ben Braymer, Potomac (21 games, 11 starts), Hagerstown (seven games): Working as the back end in many a piggyback situation early in the year, Braymer experienced the same success as a starter and reliever this season. The third-year southpaw made the most of his 114 2/3 innings, leading Nationals Minor Leaguers with a 2.28 ERA and 1.09 WHIP across two levels. Over his final 27 innings, Braymer was locked, yielding three earned runs. "He succeeded in all of the different roles, so it shows you how mentally tough this young man is," Scialabba said. "His fastball command continues to improve, his curveball is the bread and butter, it's a tough pitch to hit and lefties have a tough time with it. That's going to be his bread and butter -- the main weapon -- for him as he progresses through the system. And the changeup is a pitch that he'll continue to keep hitters honest with changing speeds. "It's really the fastball-curveball combination with the changeup, but really pleased with his mental toughness pitching in different roles and finishing up the [Arizona Fall League] in the 'pen. It was a long year for him." Relief pitcher -- James Bourque, Harrisburg (15 games), Potomac (26 games): In his third full year in the system, Bourque recorded his best professional season as a steady reliever at two levels. After posting ERAs over 5.00 in consecutive years, Bourque gave Potomac and Harrisburg a steady stream of shutdown frames, finishing the year with a 1.70 ERA and 1.06 WHIP, striking out 76 batters over 53 innings. The bounceback season culminated with 12 2/3 consecutive scoreless frames to end the season.